Contact lenses marked card is very easy to manipulate, with this tricking cards, you can control the decks oneself alone without any partner. When you wear special contact lenses, you can read the marks in the middle of the back of the juiced cards, but the naked eyes cannot see them. You just need one deck of marked playing cards and one pair of special contact lens, then you will become the king on the poker table. Our marked playing cards are the latest and the best juiced marked cards in the world. Our experienced technician researches the new technique and improves the mark each season. 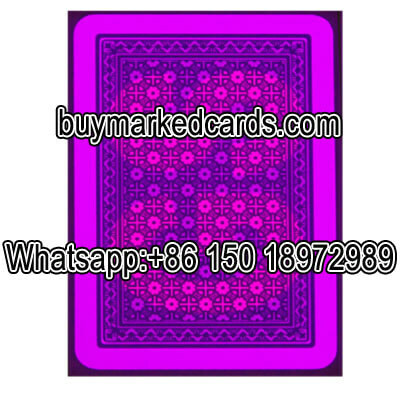 All marked cards will be quality checked before the shipment; to make sure each piece of the marked cards poker reaches the professional juiced playing cards level. With our best quality lenses and marked cards, it will help you impressed your audience in Magic Show or friends in a poker game, and also can help you success in Texas Hold'em or Omaha game. You can also order to make the best way mark cards in your own style, just need to send us a rough draft of your idea. This kind of NTP cards not only can mark for contact lenses, but also can mark for scanning system. Using this scanning marked cards or barcode marked cards in your games, scanning system can tell you the first and second winner, even the rank of all players correctly and accurately.